For God so loved the world that he gave his only Son, so that everyone who believes in him might not perish but might have eternal life. For God did not send his Son into the world to condemn the world, but that the world might be saved through him. Whoever believes in him will not be condemned, but whoever does not believe has already been condemned, because he has not believed in the name of the only Son of God. This Solemnity of the Most Holy Trinity celebrates the most fundamental mystery of our Catholic faith. It is the only day of the year when we stop to consider and meditate on who God is in Himself. Many times, we consider just our Lord or just the Holy Spirit but today, we think of God as three persons in one God. This idea was very difficult for the Jews to grasp. You see, the Jews believe in one God and that one God is one person. You and I, however, as Catholics believe in one God as well but that one God is three persons. For the Jews, that sounds like polytheism, but it is not. We do believe in one God, just as we say in the Creed but He is three persons. This is a deep, deep mystery. 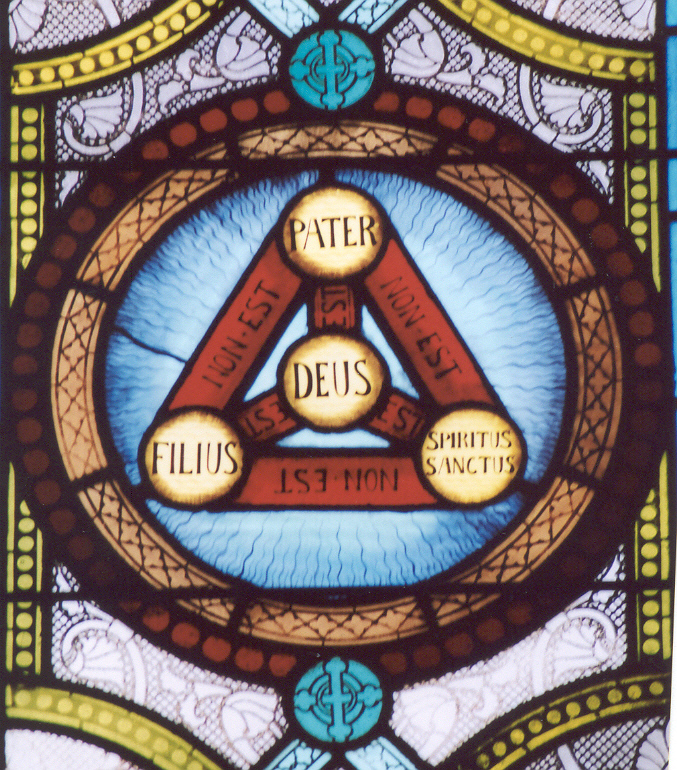 So, how should we understand the Trinity? It's a question many Christians ask. Catholic doctrine teaches that there are three persons in one God who all share the same nature. Remember that we are talking about three persons in one God; not three gods or three faces of one god. Three persons. Here are some ways of trying to understand the Trinity: St. Patrick of Ireland tried to explain it with a shamrock. The shamrock has three different sections that constitute one shamrock. Each section is distinct and yet is of the same nature of "shamrockness" as the other sections within the flower. Yet the analogy falls short because the shamrock can be divided into three parts and God cannot. Here's another analogy: You can have three business partners in one venture. Each has the ability of the other two - to sell, to hire, to lease, etc. Yet, each is distinct. This gives us the idea of how three persons can share the same abilities and do all things together and yet remain distinct. Yet, this analogy falls somewhat short as well for the partners existed before the partnership and could be without it, whereas the three persons of the Trinity could never be apart from each other and whereas business partners can do things on their own. the Trinity always acts together. Even in our worship of the Eucharist - we say that Jesus is really and substantially present - body, blood, soul and divinity. Where Jesus is, the Father and the Holy Spirit are not far behind. There is a special dynamic at work here: Father loving Son; Son loving Father totally and unconditionally, from all eternity and the agent of love between them that is breathed forth is the Holy Spirit - not in time, but from all eternity. In prayer, we should be asking God for the grace to get caught up in the conversation between the three persons of the Trinity, to be more than a spectator, but rather - a participant in the very inner life of God. By revealing Himself as three persons, God shows us who love is. When we say that God or the Trinity is love, what we are really saying is that love is not merely an aspect of God. Rather, love IS who God IS in Himself - three persons loving each other in totality. There is no in-fighting in God or dissent. There is only unity, peace, harmony and love. The Trinity reveals to us that love is at the essence of each person's calling and our vocations to marriage, the single life or to the priesthood and religious life are the deepest way of living out that love. We should ask if we are imaging the Trinity in our loves: in our marriages and families; in our places of work; in our schools. Are we becoming persons of communion? This notion of communion is integral to Trinity. Since we are created in God's image, the Trinity reveals that we are meant to be in relation with other persons. We were created to love and to be loved. Being in relation is part of what it means to be human. I was at a Walmart store some months ago buying some supplies and I used the automatic checkout where I had to follow the instruction of this checkout machine who has that voice that you hear on every computer-generated answering machine. You know the voice. It's haunting - she's everywhere. I was at first thrilled by the fact that I could do this all by myself and yet I walked away feeling empty. I went through an entire Walmart without really having had any interaction with any other person. I then proceeded to an ATM machine and then to buy gas by paying at the pump. Not once did I say anything to another persons. When I return calls, I often speak to a voice mailbox and not a real persons. How often am I tempted to use email instead of calling another person because I don't want to "bother" them. While none of these things are inherently evil, we do need to guard against this de-personalization of modern living: the Trinity show us that we were created to be in relation with each other. Even businesses know that one of the most important ways to retain customer loyalty is through personalized service. So often we see persons patronize a certain business because they are known there and they get that personal touch. Even if that business charges more than the competitor, the personal touch is often the reason they keep coming back. And, even when we do have to interact with others, what has happened to common courtesy? How often must I remind our teens to greet their elders when they walk into a room? This is not just a matter of a lack of social graces - it's a real lack of formation in knowing that we are made for communion with one another. How often do you see others avoid acknowledging you with eye contact? If you try to, in some places, people think you're up to no good. Some feel as if eye contact is the same as stalking another person. As we continue this celebration of the solemnity of the Most Holy Trinity, let us ask the Blessed Mother, she who is daughter of the Father, mother of the Son and spouse of the Holy Spirit to secure those graces for us to help us participate more fully in the inner life of the Trinity by our good works, prayers and worthy participation in the sacraments so as to enter more deeply into the very life of God who is love. May the Blessed Mother, whose "yes" at the Annunciation set the work of our redemption into motion, remind us that we should have a deep and personal relationship with each person of the Trinity, just as she did and that it is in living in communion daily that we better image the inner life of God Himself. She is the fount through which all graces flow, as we sing in the hymn, Hail Holy Queen. May we more deeply trust in her maternal care, knowing that all of God graces flow to through her and all of our prayers flow back to God through her as she places them before His throne.